If 2008 was the year of the Netbook, is it too late for Nokia to jump on the bandwagon? Mikey Bee of NokNok.tv doesn’t thing so, noting that while the company talked up its recently announced N97 smartphone for its Netbook-like qualities (despite featuring a comparatively small 3.5 inch screen), it also fazed out the WiMAX version of its rather long in the tooth N810 Internet Tablet, perhaps paving the way for a new Nokia device designed primarily for surfing the web. 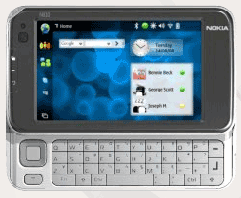 How might a Nokia ‘Netbook’ shape up? Were the company to release such a device, I’d expect it to follow many of the design lines of its existing Internet Tablet range, powered by the Linux-based Maemo OS but featuring a larger screen (topping out at 7 inches). Rather than a slide out keyboard, I think a more traditional clam shell design should be incorporated, a major part of the appeal of existing Netbooks (as apposed to less popular tablet PCs or UMPCs). Software-wise, the device would tie into all of the company’s web services, including Share on Ovi, along with support for third-party social networking sites, such as Facebook and Twitter, which could easily be added through widgets on the home screen, just like the existing N810 User Interface and that used on the upcoming N97. Obviously, a Nokia Netbook would feature WiFi but it would also be a smart move to include an option for 3G and to pitch the device at mobile carriers who are currently offering first generation Netbooks heavily subsidized with an 18-24 month mobile broadband contract. This would of course mean Nokia keeping the price of its Netbook very competitive and not pulling a Sony with a high-end device miles outside of most consumers’ reach. What do you think Nokia could bring to the Netbook market?